Philips healthcare has created a research lab in the area of imaging at Radiodiagnosis department, Kasturba Medical College, Manipal. This joint research activity has transformed into a research lab known as Medical Imaging Research Suite (MIRS) where post graduate interns, research students, radiologists and engineers work together towards healthcare innovation. Support from Manipal University for this joint research will be in the form of research scholarship for 3 years as per the University guidelines. In addition, the candidate will also be eligible for leave and support for the conferences as per the University guidelines. Philips will support towards the clinical science keys for the research development and also the expenses of the candidate for training in the area of MR pulse programming at Europe. Small, robust and extremely non-magnetic! 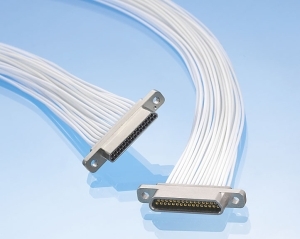 These are the qualities of the new micro-D connectors developed by Axon’ Cable. These miniature connectors are designed for devices, which rely on magnetism when operating. This is the case, for example, for MRI scanners where the magnetic field generated must remain constant and stable to obtain reliable and high quality 3D images. The non-magnetic connectors developed by Axon’ Cable have not only a very low residual magnetic field (less than 1 nT – about 50,000 times lower than the earth’s magnetic field), but it is also almost impossible to magnetize them. They cannot, therefore, interfere with the magnetic fields produced by the magnets of medical imaging devices or particle accelerators used by scientists. MIRA is a leading and fast growing Institute for Biomedical Technology and Technical Medicine at the University of Twente. Within MIRA, research is grouped into 3 research tracks: Tissue Regeneration, Neural & Motor Systems and Imaging & Diagnostics. The institute combines fundamental and applied research with clinical practice. It has full professors in all these 3 realms. MIRA works closely with hospitals, the business community and governmental organizations, aiming to secure its highly valued position in Europe. Moreover, MIRA actively encourages its scientists to bring proprietary technologies to the market. It has given birth to dozens of companies and license deals in order to make its top technology widely accessible to patients. Dr. Hornak is Professor of Chemistry and Imaging Science at the Rochester Institute of Technology where he teaches courses in magnetic resonance imaging, nuclear magnetic resonance spectroscopy, analytical chemistry, and physical chemistry. He is also Director of the Magnetic Resonance Laboratory, a research and development laboratory on the RIT campus. His research interests include multi-spectral tissue classification with magnetic resonance images, near-surface MRI, low-frequency electron spin resonance of free radicals, magnetic resonance hardware development, and magnetic resonance imaging of materials. At a seminar in the Bell Communications Research Colloquia Series, Dr. Richard W. Hamming, a Professor at the Naval Postgraduate School in Monterey, California and a retired Bell Labs scientist, gave a very interesting and stimulating talk, `You and Your Research’ to an overflow audience of some 200 Bellcore staff members and visitors at the Morris Research and Engineering Center on March 7, 1986. This talk centered on Hamming’s observations and research on the question “Why do so few scientists make significant contributions and so many are forgotten in the long run?” From his more than forty years of experience, thirty of which were at Bell Laboratories, he has made a number of direct observations, asked very pointed questions of scientists about what, how, and why they did things, studied the lives of great scientists and great contributions, and has done introspection and studied theories of creativity. The talk is about what he has learned in terms of the properties of the individual scientists, their abilities, traits, working habits, attitudes, and philosophy.